APPLICATIONS FOR THE ORAL HISTORY STUDENT INTERNSHIP CYCLE OF SUMMER 2019 IS NOW CLOSE - Check back Again in 2020! The 1947 Partition Archive's 6 week paid summer internship program is designed exclusively for currently enrolled students. For all other internship opportunities, check here. For the Story Scholars Program check here. For job opportunities, check here. Applicants must be verified Citizen Historians to be considered for the internship. To become a Citizen Historian, you must have attended an Oral History Workshop and have conducted and submitted an interview with a Partition witness in your community. Applications are now close. The Oral History Student Internship is a full-time two-month commitment, ideal for students who are on Summer break. 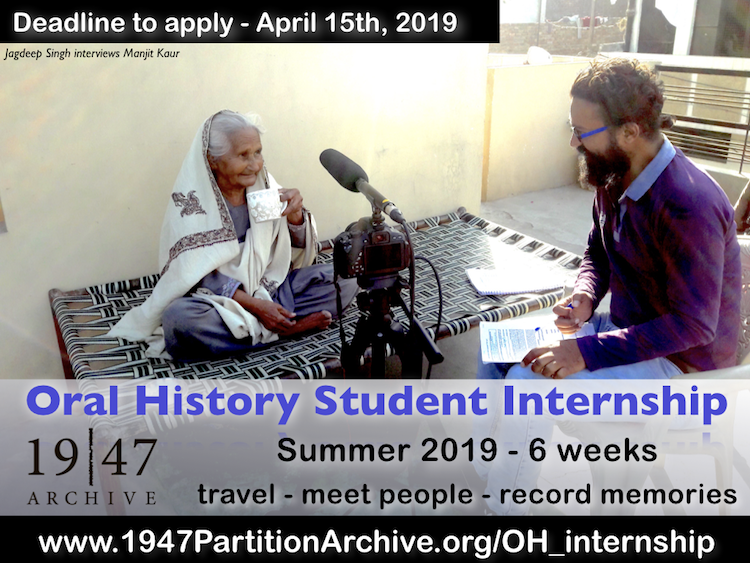 About the Oral History Student Intership: The 1947 Partition Archive Provides a platform to record, preserve and share narratives of Paritition created for and by people across the globe. We want to educate the world on Partition, especially through first-hand accounts and lived experiences. The OHSI program is one of our initiatives to collect stories from Partition witnesses. The Archive works to ignite research and discovery based on lived Partition experiences. The OHSI Program is ideal for students who have a deep interest and passion for modern South Asian history and storytelling, as well as a passion for travelling, writing, meeting new people and gaining a better understanding of the world and culture around them. OHSIs will reach out to individuals in their community who have witnessed Partition firsthand (migrants and non-migrants), record their oral histories and share them through the Archive's web portal and media collaborations. The promary differences between the OHSI and other 1947 Partition Archive programs is the time length commitment, the work requirement, and the duration, Oral History Student Interns will be eligible at the end of their term to continue as part-time Oral History Apprentices during the school year. Like other internship programs, the OHSI is strictly monitored and all program requirements must be met and on-time. OHSIs may be granted opportunities to present their work in public and academic spaces. OHSIs will receive a modest stipend to help with travel and other logisitcal costs, and a certificate upon successful completion of the program. Oral History Student Internship Program Length: 6 weeks. Collect a total of 24 interviews (4 per week). Oral History Program Interns are highly motivated and enthusiastic individuals with a deep interest and passion for modern South Asian history and storytelling. OHSIs are individuals who wish to participate in and devote themselves to expanding and broadening the understanding of modern South Asian history. The Oral History Student Internship Program is ideal for individuals who have a passion for traveling, writing, meeting new people and gaining a better understanding of the world and culture around them. This is an accelerated and rigorous full-time internship that requires working with elders, comfort with technology, and stellar organization skills. OHSIs are expected to develop ownership of their project, be flexible with their working hours, ready to work hard and devote their time in realizing the Archive’s mission. The 1947 Partition Archive encourages OHSIs to participate in public outreach programs and activities where they can further our mission to collect, document and preserve narratives. What can OHSIs expect? Oral History Student Interns will receive relevant training, fieldwork experience, and consistent support from Archive staff. All OHSIs will be working under the guidance of the program coordinator. Oral History Student Interns' work will be published and widely distributed through The 1947 Partition Archive website, social media, physical exhibits and via other media collaborations. Currently enrolled college students of any discipline. Notice: For all other internship opportunities, check here. For the Story Scholars Program check here. For job opportunities, check here.